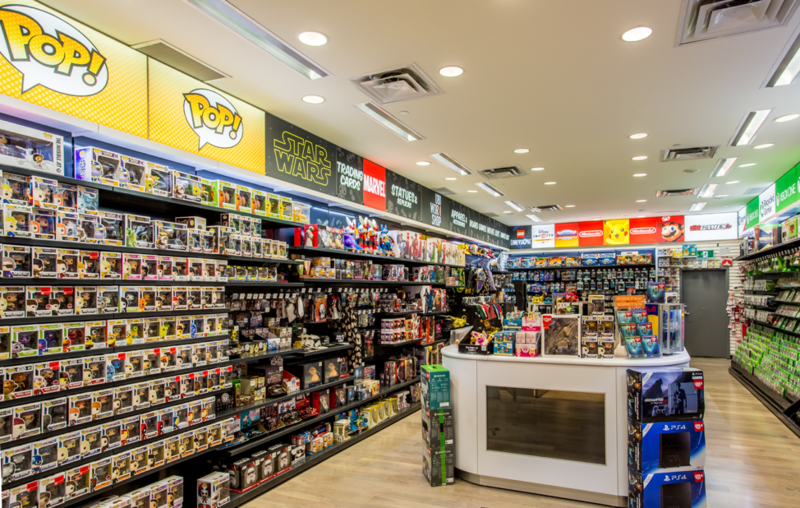 Customer Spotlight: EB Games (a subsidiary of GameStop) – Simple Engineering, Amazing Results. EB Games is a gaming company is well known throughout Canada as the leading retailer of on-trend, cutting-edge video games and gaming systems. With new games constantly entering the market, EB Games needed a way to easily change their in-store signage and displays on a regular basis. EB Games and McRae design team worked together to come up with a concept that addressed the above challenges very effectively. Headliner Modular Fabric lightboxes across the top of the shelving allow for impactful graphics and a modern feeling to the store. There is an improved overall look and consistency across the store locations. Easy Interchangeable Merchandising – Both teams worked together and created a new way to place the lights in the lightbox frame which allows for the sign length to be changed from 2ft to 6ft to 8ft with no concern of shadows or hotspots. This makes for affordable easy sign changes for promotions and game updates. In-Store Columns – were a later addition to the store redesign wrapping the columns with lightboxes has allowed for additional merchandising options and brought some additional color and light into store layout. EB Games store management was so impressed with the outcome that they decided to roll out the concept to seventy stores for the initial trial. In the new sign trial period, after the new signage and design were installed, the same EB Games stores saw a dramatic increase in same stores sales revenue. The McRae team is proud to have created such innovative and visually stunning concepts for this project and is honored to have been given the opportunity to work with EB Games. Do Lightboxes Have a Clear ROI?